During the recent room changes, we got rid of the boys' dressers. DH put shelves into one half of the closet, and I picked up these bins to store the clothes. The top shelf holds sweatshirts and long sleeve shirts. The 3 small bins hold shorts, underpants and socks. The next 2 bins hold character/play shirts and plain/nicer shirts. 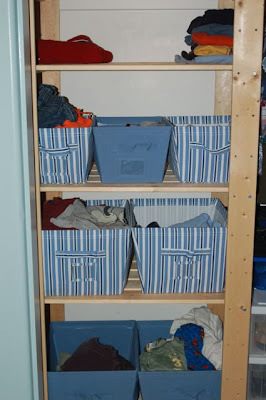 The bottom 2 bins hold pants and pajamas. The bins have been working out great! The boys' laundry is done on Tuesdays. I wash and dry the clothes, but they are responsible for putting the clothes away. We always had separate drawers, so it wasn't much of a change except for floor space in their rooms, and they can't leave the drawers hanging open! I can also easily see how many clothes they have, and if anything is needed. They don't need more clothes than can fit into the bins! I just read a tip on Parent Hacks this morning about storing sets of color-coordinated clothes in separate bins so that children can choose outfits that always match. My boys are pretty good about matching outfits, but this is a great idea for younger kids, and my storage solution could be easily adapted for that idea. How neat and tidy! Hope all is well with you and yours Melanie. I love this idea :o) Dh & I have been trying to figure out what to do about the boys' clothes. This looks like just the thing. Oooh - that looks fantastic! What a great way to store their stuff!